About 40 firefighters have tackled what has been described as a large fire at a primary school in Aberdeenshire in the early hours of the morning. 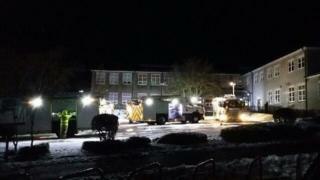 Six pumps and a control unit were sent to the scene at Meldrum Primary in Oldmeldrum at about 03:00. It took more than an hour to bring the fire under control. The school will be closed to pupils and staff on Wednesday. The cause of the blaze is being investigated.